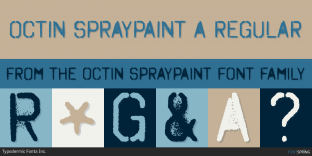 Searching for fonts that look like Octin Spraypaint? Look no further! Here you will find fonts that look like Octin Spraypaint. Use the selector above to match other fonts in the family. Worry-Free! Octin Stencil Typodermic Fonts Inc.
Reload Stencil AE Type Inc.
Worry-Free! Octin Vintage Typodermic Fonts Inc.
Reload Alt Stencil AE Type Inc.
Worry-Free! Gaz Typodermic Fonts Inc.
Worry-Free! Cotton Typodermic Fonts Inc.
Worry-Free! Domyouji Typodermic Fonts Inc.
Worry-Free! Jillican Typodermic Fonts Inc.
Worry-Free! Dirtstorm Typodermic Fonts Inc.
Worry-Free! Pakenham Typodermic Fonts Inc.
Worry-Free! Dirty Baker's Dozen Typodermic Fonts Inc.
Worry-Free! Octin College Typodermic Fonts Inc.
Reload Alt AE Type Inc.
70% off until Apr 30th!